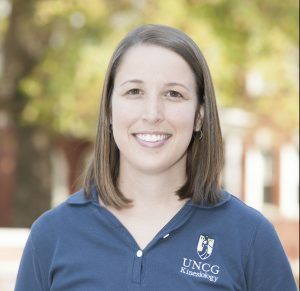 The Department of Kinesiology is proud to highlight Dr. Erin Reifsteck, one of its many esteemed alumni who have invested their knowledge and skills gained at UNCG to work professionally. As an alum of both the Master’s as well as the Doctoral program, Reifsteck brings an especially strong perspective to her work through teaching, mentoring, and researching. How did your PhD prepare you for your career? Through my PhD program I was able to take a range of coursework across the kinesiology discipline (e.g., sport and exercise psychology, neural aspects of motor control, sociology of sport, exercise prescription, etc) and beyond (e.g., qualitative research, feminist theory, structural equation modeling, etc) that prepared me to conduct interdisciplinary research and also cultivated a broad view of our field that has helped me mentor graduate students with diverse interests. What current research are you completing? My main research focuses on understanding and promoting lifetime physical activity, health, and well-being through sport and life transitions. With funding from the NCAA over the past two years, my research team and I have worked on the development and evaluation of the Moving On! program, which is designed to help student-athletes make healthy transitions to life after college sports by promoting lifetime physical activity and healthy eating (AthletesMovingOn.org). This year we received funding from the School of Health and Human Sciences to track physical activity and health outcomes of senior student-athletes as they transition out of college sports. What’s your favorite thing about your career? Great faculty mentors during both my undergraduate and graduate studies had a big impact on my own professional development over the years and inspired me to want to become a college professor. I feel privileged to be in a position where I continually get to learn and be challenged intellectually in new ways. I always liked being a student (at least enough to go through 9 consecutive years of higher education), and I suppose working in academia means I’ll never really have to stop being one. I also appreciate the flexibility to pursue research topics that are personally meaningful to me, and I enjoy the opportunity to mentor students as they develop and pursue their own research and professional interests. UNCG has always felt like home to me. I believe that our department has created a supportive, collegial environment that is truly invested in the success of faculty, staff, and students. Do you have any advice for students seeking or considering higher education such as a Ph.D.? Take some time to really consider your long-term career goals. In the field of sport and exercise psychology in particular, there really is no one defined path- which can be both exciting and frustrating for students interested in this field. But, knowing where you ultimately want to end up will guide you toward choosing the path to get there that makes the most sense for you. I am an assistant professor in the Dept of Kinesiology at UNCG. I received a PhD and MS in sport and exercise psychology from UNCG along with a doctoral minor in educational research methodology and a graduate certificate in women’s and gender studies. I primarily teach courses in the EdD in KIN program such as Mixed Methods in Kinesiology Research and Grant Writing. Prior to coming to UNCG, I competed as a Division I field hockey goalkeeper at Saint Francis University in Pennsylvania. I am also a third degree black belt and level 4 certified instructor with Taekwondo America. In my free time, I enjoy spending time outdoors with my husband and two basset hounds. This entry was posted in EdD, News, Profile. Bookmark the permalink.